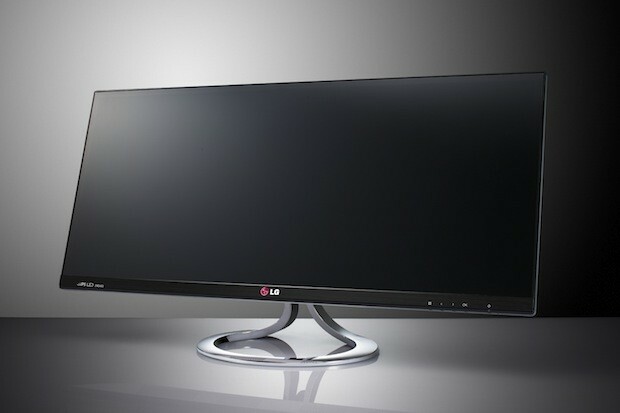 While "ultrawidescreen" 21:9 aspect ratio HDTVs haven't taken off despite several attempts, LG is bringing the formfactor to the desktop with its new EA93 UltraWide LCD monitor. Measuring at 29-inches with a resolution of 2,560 x 1,080, it uses the extra horizontal space to display not just cinema-style movies, but also side by side video from different sources or up to four different views at once thanks to its built-in software. For connections, it has DVI Dual Link, DisplayPort, or HDMI with MHL support. We got an eyeful of the monitor at IFA earlier this year and you can check out our hands-on video after the break, or take a quick Korean vacation to snag one for 690,000 won ($633) before they go on sale everywhere else later in the year -- pricing elsewhere has not yet been announced. SEOUL, Nov. 8, 2012 – LG Electronics (LG) today announced the launch of its EA93 UltraWide Monitor, the world's first to boast a 21:9 aspect ratio. The 29-inch screen offers ample screen real estate, a 4-Screen Split feature and 100 percent sRGB color space expression to provide better multitasking and multimedia capabilities. Designed for maximizing productivity, the monitor employs an IPS display to produce lifelike colors, making it an impressive addition to the home, office or studio. "LG is always working to expand the definition of what technology is and how it can contribute to productivity and convenience. Whether its for work, watching movies, playing games or anything else in between, the UltraWide Monitor enhances the multitasking and multimedia experience," said J.J. Lee, Executive Vice President and Head of the IT Business Unit at the LG Home Entertainment Company. "The cinematic proportions, diverse color range and all-around functionality of the UltraWide Monitor clearly demonstrate an ongoing commitment to innovation." The UltraWide Monitor is an excellent addition to any work environment. The monitor's expansive 29-inch screen provides plenty of room for multiple documents and windows to be viewed at one time. The expansive display also allows more spreadsheet columns to be viewed at once or a two-page document to be read side-by-side. The UltraWide Monitor is also an outstanding device for graphics professionals. The monitor enables artists to see more and do more with their time. Transforming the monitor into the ultimate multitasking tool, the 4-Screen Split feature can divide the screen into up to four segments, each of which can be uniquely customized. Graphic designers generally utilize a dual-monitor configuration, allowing them to compare and contrast the material they are editing. However, dual monitors can cause color inconsistencies between screens. The UltraWide monitor, on the other hand, can connect the monitor to two external devices via Dual Link-up, providing consistent color across the entire screen, eliminating the bezels that typically divide the view in dual-monitor set-ups. Additionally, the monitor offers 100 percent of the sRGB color space and is hardware-color-calibration ready, making it perfectly adept at expressing consistent true-to-life colors that graphics professionals require. The UltraWide Monitor's 21:9 aspect ratio is very close to the dimensions of movie theater screens. Its cinematic dimensions allow the monitor to display films the way they were intended. The monitor also takes advantage of IPS display technology so viewers can enjoy lifelike picture quality movies at almost any angle. The combination of four different features – 21:9 aspect ratio, amazing image quality, brilliant color expression and LG's CINEMA SCREEN Design – makes the UltraWide Monitor ideal for movie buffs and video games. Gamers can also play games and videos from their smartphones on the monitor via the included MHL connection. The addition of two 7W stereo speakers adds to the immersive entertainment experience. LG's UltraWide Monitor will be introduced in Korea early this month and rolled-out globally in the weeks following.